BLOGIS Holdings Limited (referred to as "BLOGIS") is a high-end logistics investment platform jointly founded by Shenzhen Chiwan Petroleum Supply Base Co., Ltd. (“SCPSB”) and China Nanshan Development (Group) Co., Ltd. .
As a domestic leading provider of international logistics parks, BLOGIS has been operating or developing 25 high-end modern logistics parks located in 22 economically dynamic cities nationwide in China. At present, more than 1.5 million ㎡ of modern warehousing facilities are being operated by BLOGIS while 750 thousand ㎡ are under construction forming an efficient logistics network with strategic nodes covering major logistics hubs and urban distribution centers. BLOGIS always wholeheartedly provides our clients, including third party logistics companies, manufacturers, retailers, wholesalers and etc, with efficient, superior and safe diversified services such as logistics facility services, transportation services and value-added services aiming at helping them to reduce the logistics costs and improve supply chain management efficiency. Shenzhen Chiwan Petroleum Supply Base Co., Ltd. (“SCPSB”) was founded in 1984 as a joint venture company by China Nanshan Development (Group) Incorporation and Offshore Joint Service (Bases) Company of Singapore Private Limited. It is close to the Pearl River Estuary, next to Chiwan Terminal at Shekou, and also adjacent to Hong Kong. It is dedicated to providing logistical services for petroleum and natural gas exploration, exploitation and production operators in the South China Sea. 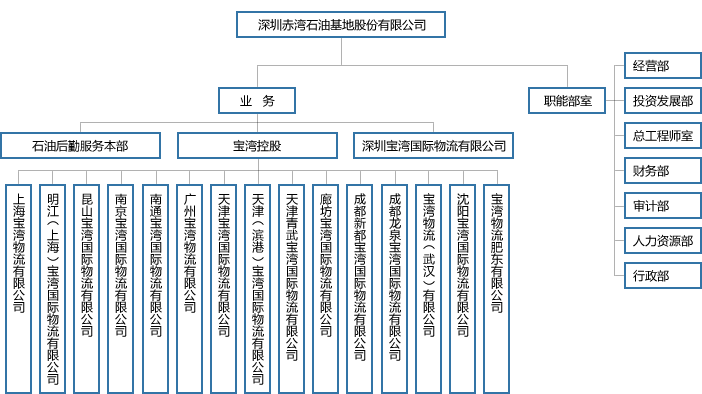 In 1995, SCPSB was successfully listed on the Shenzhen Stock Exchange (Stock Code: 200053). It has developed into a diversified conglomerate with key business in the petroleum logistics service, offshore engineering service and general logistics service. Since 1984, through the cooperation with one of its shareholders, Offshore Joint Services (Base) Company of Singapore Private Ltd., SCPSB has been acting as the only petroleum supply service base for offshore oil industry in the eastern region of South China Sea providing comprehensive supply services to the international famous operators of offshore exploration and production in petroleum and natural gas. Known as one of the four largest oil logistics service bases in the world, SCPSB enjoys a high reputation in the industry. Petroleum supply services include warehousing, logistics, wharf services, handling and transportation services and offices rental. Along with China National Offshore Oil Corporation and Singapore CSE Holding Company, SCPSB invested to jointly establish Shenzhen Chiwan Sembawang Engineering Co., Ltd (CSE) on purpose to get into the field of large steel structure engineering and marine engineering. Sembawang has obtained the qualification of National Class A Marine Engineering and passed a series of quality authentications including ISO9001 and DNV. The 18,000-ton jacket that we constructed for the Panyu 30-1 oilfield is the largest one in Asia at present with a height of 210 meters.